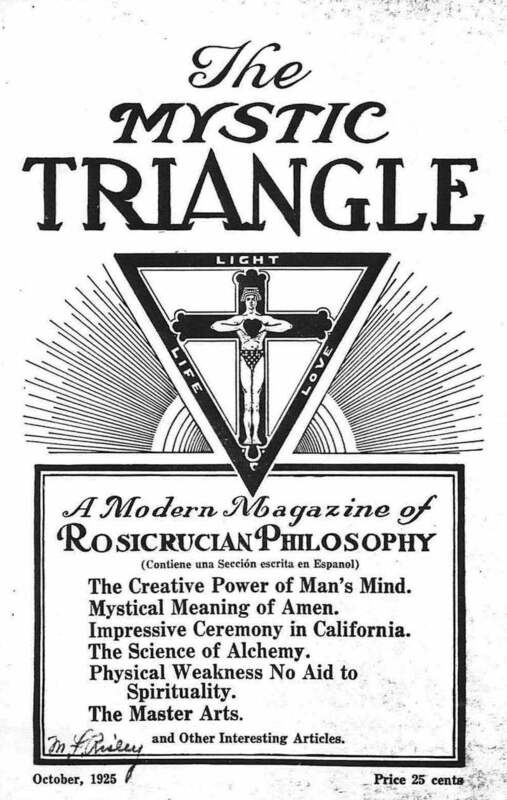 A Modern Magazine of Rosicrucian Philosophy. San Francisco, CA. Language: English and Spanish. Publisher: American Supreme Council of the Ancient and Mystical Order Rosae Crucis. Editor: H. Spencer Lewis. Succeeds: American Rosae Crucis->Cromaat->American Rosae Crucis->The Triangle Succeeded by: Rosicrucian Digest. 2/5, May 1925-1929. 14 pp. With the change from The Triangle, the journal deliberately set out to "aid the seeker for such a magazine to recognize at once that this magazine pertains to mystical things." The journal urged its members to buy extra copies and distribute them free of charge to newsstands and book sellers. It also began to carry a section in Spanish and to print the mystical fiction of Lewis. On Harvey Spencer Lewis (1883-1939), see the note under American Rosae Crucis. The bibliography of Lewis's early publications, including his journals, has been set out by David T. Rocks, "H. Spencer Lewis: A Bibliographical Survey," Theosophical History 6/6 (April 1997): 219-227. A complete index of the Mystic Triangle and the Rosicrucian Digest from 1923 to 1943, prepared by one Frater Generosus, is available.